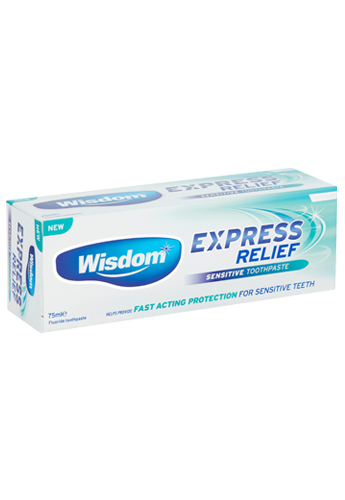 Wisdom Express Relief Sensitive toothpaste helps to repair weakened and damaged enamel to help prevent sensitivity. The advanced formulation uses the same minerals found within the tooth itself to help remineralise tooth enamel. 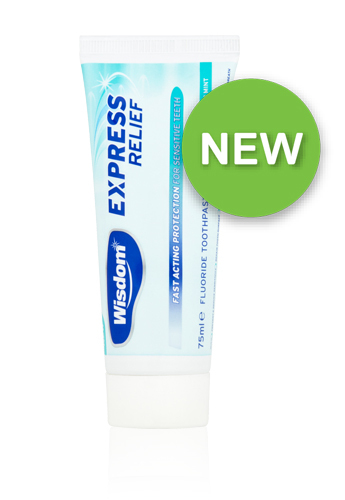 The formula works quickly to effectively block the exposed channels to help prevent sensitivity, whilst a desensitizing ingredient sooths nerve endings to provide quick relief as well as long term sensitivity protection*. Ingredients: Aqua, Sorbitol, Hydrated Silica, PEG-8, Glycerin, Potassium Citrate, Hydroxyapatite, Sodium Bicarbonate, Sodium Methyl Cocoyl Taurate, Sodium Monofluorophosphate, Aroma, Limonene, Xanthan Gum, Carrageenan, Titanium Dioxide, Cellulose Gum, Menthol, Sodium Saccharin.